This soccer warm up with ball will prepare the players for football type movements for the session. Lots of touches - Players are encouraged to perform ball manipulation skills and tricks within the space. Awareness - In order to perform movements with the ball players should be aware of the ball, space and team mates by playing with their heads up. Create space - Players to use inventive and creative movement to find and create space for themselves and their teammates. 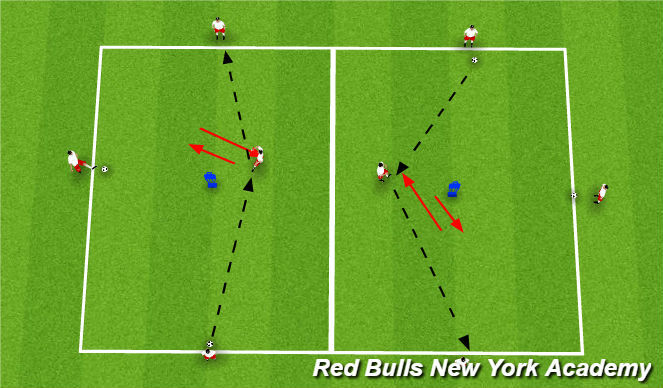 This drill encourages creative movement to receive and pass. Two areas with mannequin in middle. 4 players per area with 1 player in the middle and 3 players around the outside. 2 players on outside have footballs and middle player receives ball from team mate and passes to player without the ball, then receives the 2nd ball and passes to team mate without the ball. Rotate roles of players. Quality of pass - Players to pass with quality weight, disguise and accuracy to move the ball effectively. Replace mannequin with defender to play 3v1 with 1 ball and players stay on lines of the area. Make one area of 20m x 10m and play 6v2 with 1 ball and players stay on lines of area. This soccer drill encourages movement to receive good passes to then make decisions to shoot or maintain possession. idth and depth - Players to stretch the play by using good width within the area and supporting the play from all sides of the field. This soccer drill helps players to use movement to create space for themselves and other teammates.